PKN walked the buzzing aisles of Fantastic Food+Drink Show and the co-located Naturally Good Expo in Sydney yesterday to bring back a snapshot of our favourite new products and packs. 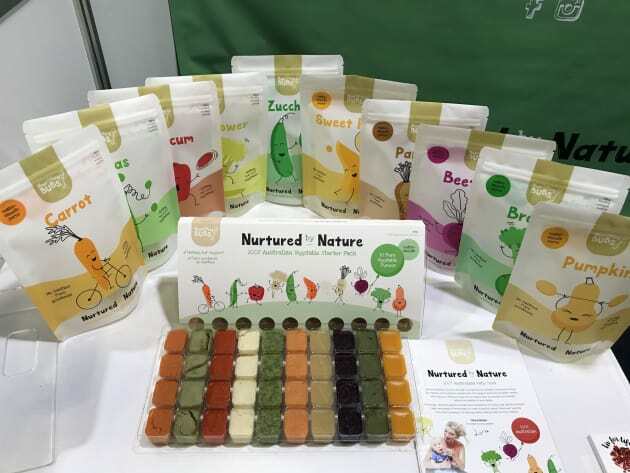 Nourishing Bubs is a brand new company with a baby food product range called Nurtured by Nature. The pureed baby food is not packed in a jar or a squeezy pouch, but comes as frozen cubes packaged two ways: 1) in a trial tray (supplied by Sydney packaging company Formrite; outer printed carton supplied by The Cutting Edge) which allows mums to trial different tastes with baby and 2) as single veg variety frozen cubes in a stand-up-pouch (pouch sourced overseas; graphic design by Amanda Meli of Meli Design) that contains 10x 30g individual portions. The concept, developed by dietitian Olivia Bates, is wholesome and convenient and in our opinion beautifully packaged to appeal the target market. The company manufactures in a commercial kitchen in Meadowbank but Bates told PKN it is in discussions with a food manufacturer in Melbourne that will be able to upscale manufacturing and take the brand to the next level. 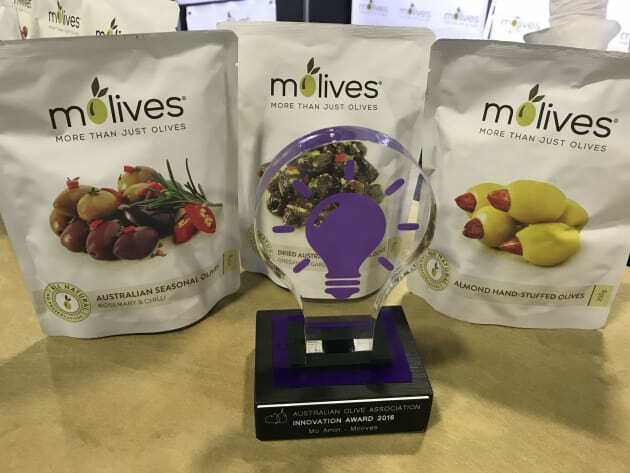 Molives is a brand doing something entirely new with olives in a pouch, with the development of a proprietary process for packaging olives without brine or any liquid, and without preservatives. The Australian grown olives are only marinated in olive oil prior to packaging. 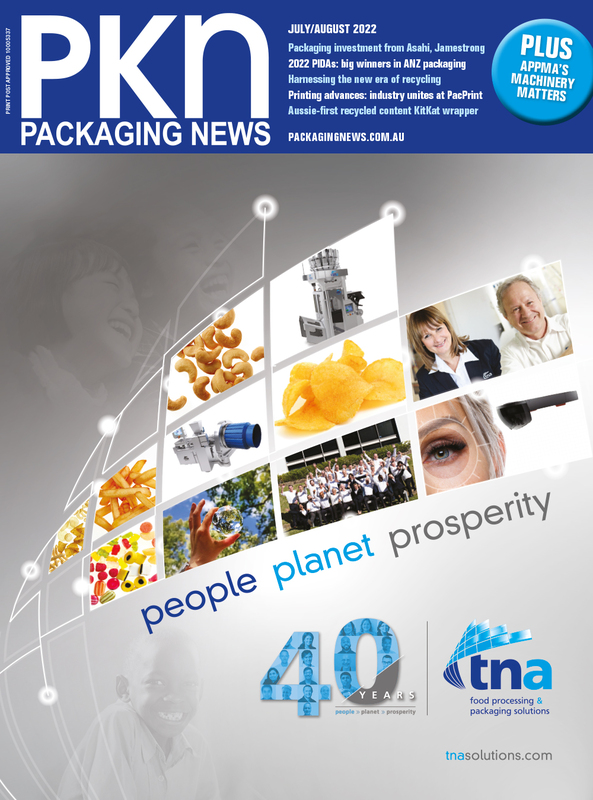 Engineer and entrepreneur behind the breakthrough development, Mo Amin, told PKN getting the 250g retail pouch packs to this stage has been four years in development. Two years ago the company achieved its first milestone with a contract to supply Virgin Airlines with a 40g Molives snack pack, but at that point the process still required a preservative for shelf stability. Since then, Amin says, the process has been refined, and now the packaging offers six months' shelf life and meets all relevant food safety standards. Amin confirmed that the company has just signed a contract to supply Molives to Qantas First Class, and is exploring opportunities in export markets as well as local retail channels. 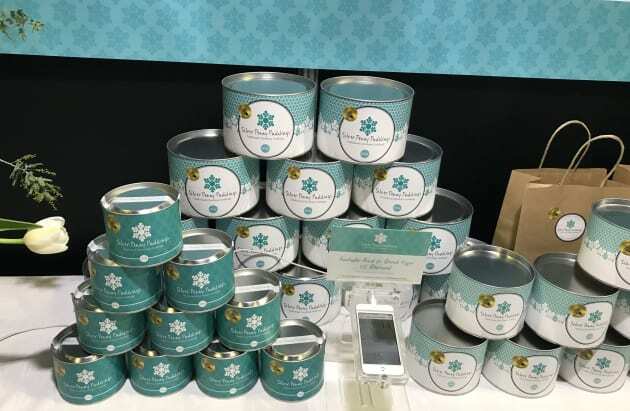 The Fresh Chai Co is a six-month-old Queensland-based start-up with a delicious range of Chai blends with striking packaging with high shelf appeal. 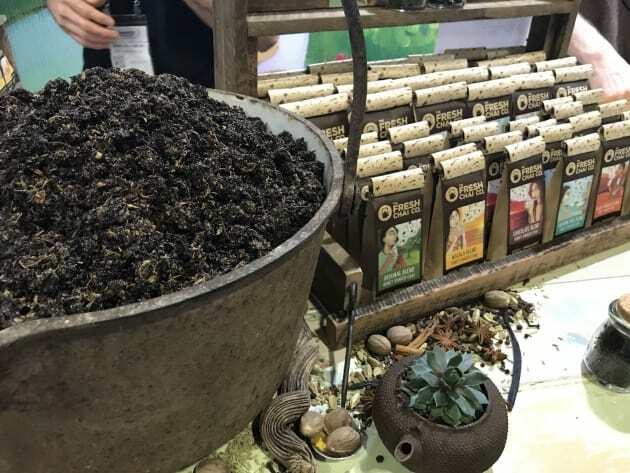 Founder Adam Donoghue told PKN the whole spices are stone-ground and blended with Assam long leaf black tea, and then soaked in local raw honey. The product is packed in a flat-bottomed stand up barrier bag/pouch. The packaging graphics were designed by Donoghue, and the the company has made use of a plain pack with different self adhesive labels for the variants. The pack has a twist tie-type of device glued to the top of the bag for easy resealing, and the instructions for how to make a good chai are printed in the fold over section at the top of the pack, creating a nice 'reveal' when the consumer opens the pack. Donoghue says the company has established itself quite quickly in leading food outlets in Queensland and is now looking to expand into other states. Biosota Organics is a Kuringai-based apiary supplying Australian Manuka honey and wild honey. 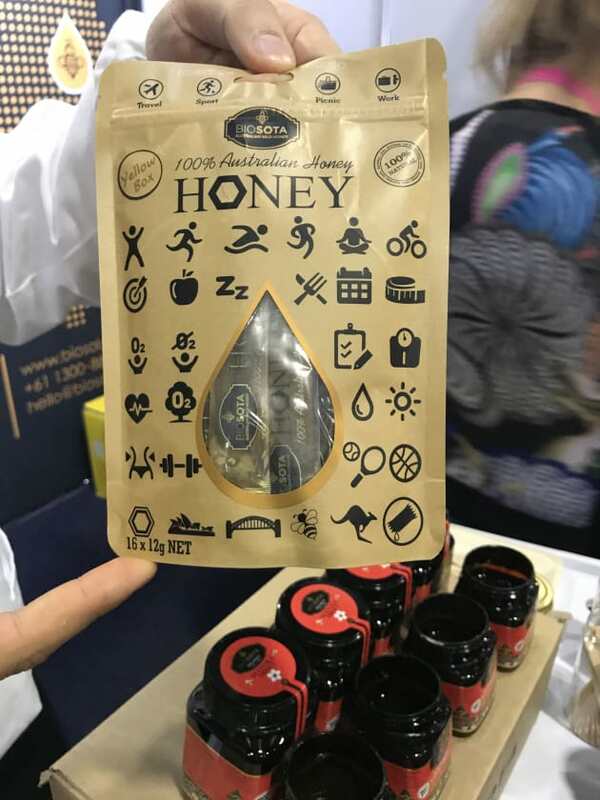 It had on display an attractive range of flavoured Manuka honeys (strawberry, turmeric etc), but what grabbed our attention on this stand was the company's 12g portion sachets of its Biosota Wild Honey brand all packed up in a ... yes, you guessed it, stand up pouch! Silver Penny Puddings' point of difference is the brand's secondary packaging in the form of a premium metal tin (supplied by Darpac in Melbourne) which is decorative enough to be reused for another purpose after the pudding has been consumed. The pudding itself comes in a microwaveable lidded plastic tub (supplied by NSW's Roblan Plastics). The packaging, designed by Jane Weeds Design, presents beautifully on shelf, and the company is also offering personalised branding as an option. Company founder Elisha Webber told us she was overwhelmed by the interest in her product particularly from export markets. Beyond the stand-out packaging, the proof is certainly in the pudding – the product having won a gold medal in the 2016 Australian Fine Food Awards . 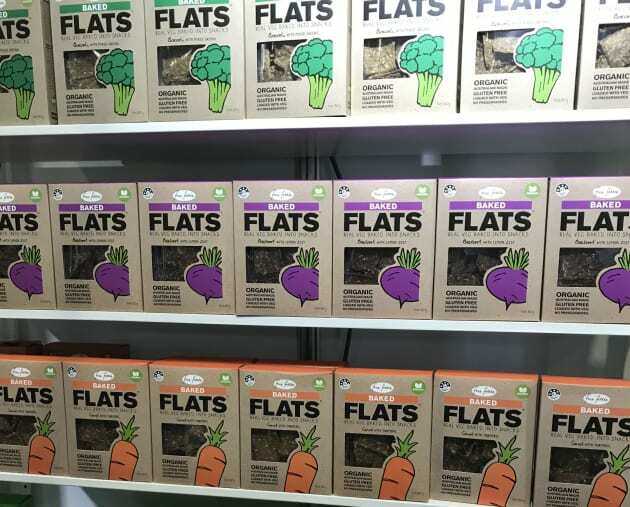 Fine Fettle has been pushing snacks category convention for some time, first with its distinctively packaged raw Flats Veg snacks, and now its new Baked Flats range that has hit the shelves. Also at the show was Fine Fettle's Eats new ready-meal range of “wholesome veggie goodness” in a coated paperboard tub with a vented lid. The dehydrated vegetable ingredients require only the addition of boiling water to the single-serve tub to recompose after an 8-10 minute wait. Although not super-quick (in the 2-minute noodle sense), it's fast enough to be convenient. 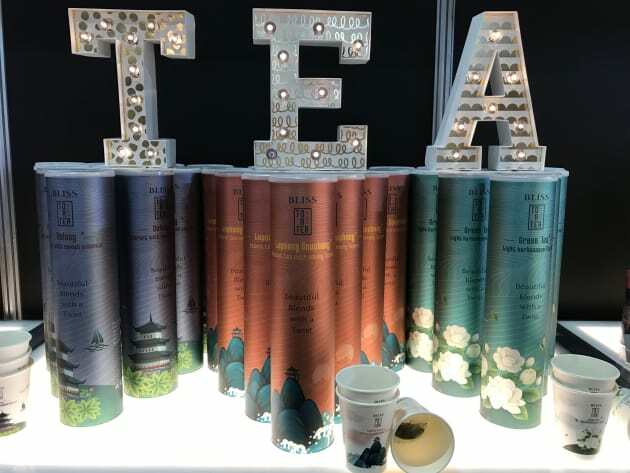 To A Tea owner and founder Lisa Barakat was excited to share news of her new specialty Bliss tea range that comes presented in ready-to-go 'clever' cups. So, the loose-leaf tea is at the base of the cup, covered with a filter membrane that has been glued in place. The double-walled lined cups (in packs of 15) come in tall paperboard canisters and both cups and canisters can be custom-printed with a customers' own branding. The packaging is imported.